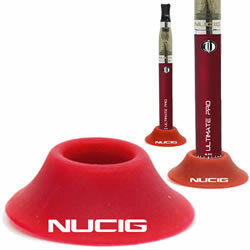 Red Rubberised ultimate/mini ecigarette suction cup holder. Simply stick down onto your desk top / table. Firmly holds your ultimate/mini ecigarette. Easily removed or can be repositioned. Great little idea from nucig. I use them to stand my tanks and my ultimate kit. Those darn things will never roll away again !